American Eagle Lands in Times Square, by Lois Weiss. The long vacant former Howard Johnson Restaurant in Times Square is finally coming back to life in one of the city's richest retail deals ever. The Post has learned that American Eagle Outfitters is flying into the prominent spot on the northwest corner of Broadway and 46th Street. 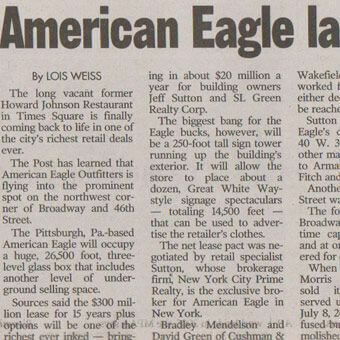 The Pittsburgh, Pa.-based American Eagle will occupy a huge, 26,500 foot, three-level glass box that includes another level of underground selling space. Sources said the $300 million lease for 15 years plus options will be one of the richest ever inked - bringing in about $20 million a year for building owners Jeff Sutton and SL Green Realty Corp. The biggest bang for the Eagle bucks, however, will be a 250-foot tall sign tower running up the building's exterior. It will allow the store to place about a dozen, Great White Way-style signage spectaculars - totaling 14,500 feet - that can be used to advertise the retailer's clothes. The net lease pact was negotiated by retail specialist Sutton, whose brokerage firm, New York City Prime Realty, is the exclusive broker for American Eagle in New York. Bradley Mendelson and David Green of Cushman & Wakefield led the team that worked for the owners. All either declined or could not be reached for comment. Sutton owns American Eagle's current flagship at 40 W. 34th St., as well as other major flagships rented to Armani, Abercrombie & Fitch and American Girl. Another property on 34th Street was rented to Apple. The former HoJo's at 1551 Broadway was a virtual time capsule for 45 years and at one time was considered for city landmarking. When the heirs of owner Morris Rubenstein finally sold it, the restaurant served up its last meals on July 8, 2005. The orange infused building was later demolished.